splendor. Tickets are on sale now at www.americanbankcenter.com. 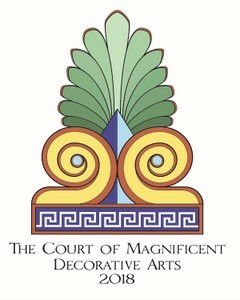 CORPUS CHRISTI, TEXAS – (APRIL 17, 2018) - Las Doñas de la Corte is proud to present “The Court of Magnificent Decorative Arts” on Thursday, May 3, at the American Bank Center Selena Auditorium. This year marks the 65th year of the annual Buccaneer Days Coronation, and the public is invited to attend. Each year Las Doñas presents this extraordinary pageant, honoring local and out-of-town families, as they celebrate the traditions of the past which are woven into the present and culminate in a magnificent night of courtly splendor. Since 1954, hundreds of families have participated in this community event. In keeping with that heritage and tradition, Duchesses and children in this year’s court represent second and often third generation family participation in this annual event. Mrs. Mike Carrell, President of Las Doñas de la Corte, has announced that this year’s Wardrobe Chairman is Mrs. Todd Hunter (Alexis). Alexis worked closely with a group of artists to create such distinct timeless deigns. The Designers of the Royal Robes include Kitty Dudics, Christina Hunter, David Phillips, and Susie and Burt Rucker. For the past two years, 22 royal gowns and trains considered true works of art, have been designed to depict this year’s theme, “The Court of Magnificent Decorative Arts.” Each Duchess will be presented in an elaborate hand-tailored costume showcasing the artistry of cultures and eras and their contributions to the decorative arts. Coronation Chairman, Mrs. John Wallace, along with Dennis Randolph and his associates at Strong Productions of Austin, plus LD Systems for sound and lighting, have created this year’s stage design. The royal gowns designs have been brought to life by the Couturiers of the Royal Robes including Georgette Afram, Gloria Bechara, Samia Bechara- Palfreyman, Monica Castillo, Andres Contreras, and Lucy Salinas. In addition to all of the time-honored Coronation traditions, Las Doñas de la Corte is also proud to partner with the Coastal Bend Community Foundation in supporting our community. Friends and family may honor Duchesses and all participants in the court by donating to the Coastal Bend Day of Giving Matching Fund through the Foundation. This is a special way to commemorate the Court during the Buccaneer Coronation as well as benefit Corpus Christi and the surrounding communities. To donate or for more information about the Coastal Bend Community Foundation, go online to www.cbcfoundation.org. The evening of the Coronation, doors at Selena Auditorium will open at 6:00 p.m. and the Coronation begins at 7:30 p.m. Immediately following the Coronation, the public is also invited to the Coronation Reception which will be held upstairs in the Henry Garrett Ballroom in the American Bank Center. At the reception guests will have the opportunity to meet the Duchesses and Royalty and observe the extraordinary costume designs. Light hors-d’oeuvres will be served and a cash bar will be available. Tickets are $60 each and will be available on ticketmaster.com starting April 5, 2018. The Royal Robes Display will be held at the Art Center of Corpus Christi – 100 Shoreline Boulevard. From May 9 – June 3, 2018. Admission is free.